Here's something new. Luke Mahler asked me if I could create a plotting method that could take a backbone phylogeny and plot subtrees using triangles that are scaled proportionally to the number of species in the subtree. I'm still working on this, but I posted some preliminary code here. The function takes a modified tree as an object of class "backbonePhylo". I'm going to make some functions to convert from "phylo" objects, but for now this has to be built manually. The "backbonePhylo" object is like a "phylo" object, but with tip.clade substituted for tip.label. 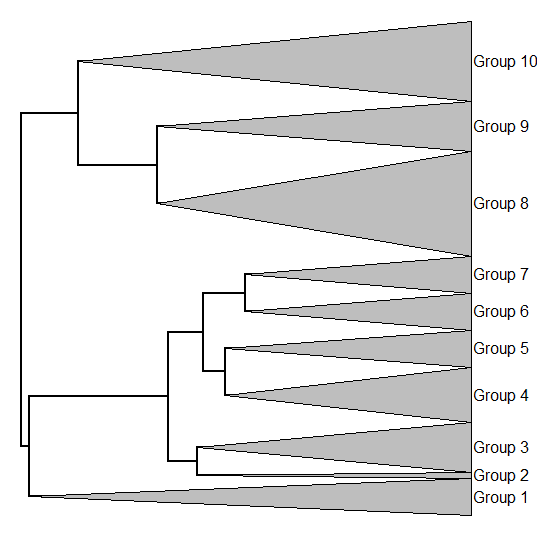 tip.clade is a list in which each subtree is represented by a label, a number of descendant taxa, and crown group depth. Backbone phylogenetic tree with 10 subtrees and 9 resolved internal nodes. Cool. That's more or less what we were going for.